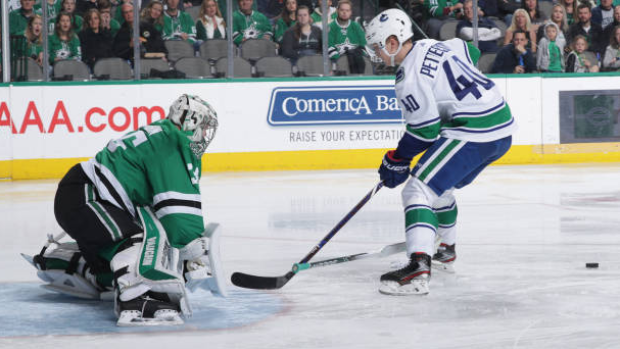 Dallas Stars goaltender Anton Khudobin lost control of his stick on a poke check to stop Vancouver Canucks rookie Elias Pettersson on a penalty shot Sunday night and head coach Travis Green said after the game he believes there's no room for doubt that Pettersson should have been awarded a goal. By NHL rules, if a goaltender throws his stick, a goal is awarded to the shooter. However, the referees did not call out Khudobin and Pettersson came up empty. The Canucks, who were up 2-0 when Pettersson took his shot, held on for a 3-2 shootout win. On Tuesday, the NHL responded to TSN 1040's Jeff Paterson's request for an explanation stating a goal was awarded because officials could not prove Khudobin purposely threw his stick. "On-ice officials felt this was a hockey play and that Khudobin was attempting a normal poke check and lost control of his stick," the league wrote. "For Hockey Ops to have overruled that, they would have had to determine conclusively that Khudobin did not lose control and fully intended to throw his stick. They could not." Pettersson, who failed to beat Khudobin in the shootout as well, said in real-time he thought the play was clean. Stars head coach Jim Montgomery believed Khudobin did not throw his stick at Pettersson, but simply had it slip from his hand on the poke check. "No, I wasn’t (worried)," Montgomery said, per The Athletic. "When I watched it live, it - (assistant coach) Stu (Barnes) said something about it - but it didn’t look like there was any intent. It looked like he lost it at the last second." Khudobin, meanwhile, was less adamant in his response when asked if he threw his stick. "What the referee said," he responded.